I love using my bread maker and trying a variety of bread machine recipes. 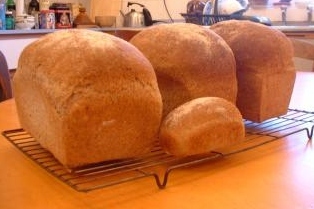 It is easy to have wonderful homemade bread at any time with the easy to use machines that are available now. This is one of the nicest honey wheat bread machine recipes, not too sweet, but just enough to balance the whole wheat flavor. It is a great bread recipe for toast or sandwiches. Put the ingredients into your bread maker in the order specified by the manufacturer's instructions. Set the machine for whole wheat bread and medium crust. Now, just press the start button and wait for your kitchen to begin to smell heavenly. Each recipe makes one loaf of bread. Canadian all purpose flour is made of a harder wheat than American flour. For that reason Canadians can use all purpose flour instead of specific bread flour or bread machine flour in this recipe. Try it both ways and see if there is a difference for you. Sorry, but I don’t know the texture of the wheat in other locations. If you have wanted to make homemade bread in a bread machine, but dreaded the odd shaped loaves that result, not to worry. The new machines give you a nice regular shaped loaf, so it’s easier to make sandwiches and you aren’t struggling with huge pieces of bread. A great alternative is to make the dough in the machine, then bake it in regular loaf pans in the oven. All bread machines are not alike. It is important to always put the ingredients into the machine in the order called for by the manufacturer to ensure the bread bakes properly. For that reason my instructions for making the bread are short. If you like this recipe, I’d love you to Pin it to Pinterest, Tweet about it, Like it on Facebook and submit your own recipes for sharing below. I made this bread for the first time yesterday and it turned out wonderful. Thank you for posting such a delicious bread recipe! The bread was really good, although the recipe for a 1.5 pound loaf was way to big for my machine. The dough pressed right up against the top “look through” part and I thought it was never going to stop rising, it didn’t bake fully on the end that was pressed up against the top, but I told my husband to use it for toast.